Buttercrunch Lettuce This vegetable is organically grown. Buttercrunch Lettuce is a compact head lettuce with a buttery flavor. Buttercrunch Lettuce will grow to a height of 14" to 16" tall and just as wide. Plant in full sun and well drained soil. Lettuce will take light frost so you can plant this a bit earlier than other crops. This lettuces will mature in about 64 to 75 days. Organically grown. Romaine Lettuce is a a very popular variety that most are familiar with. It will take 75 to 80 days to fully mature and it produces a heavy head. You can pick leaves as the lettuce is maturing to use in salads and garnishes. Romaine Lettuce will grow to a height of 16" and just as wide. Plant in full sun. Red Romaine Lettuce is a a very popular variety that most are familiar with. It will take about 60 days to fully mature. You can pick leaves as the lettuce is maturing to use in salads and garnishes. The contrasting red color will brighten up a salad. 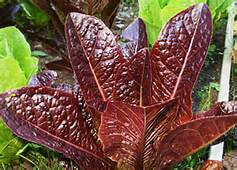 Red Romaine Lettuce will grow to a height of 16" and just as wide. Plant in full sun. Freckles Romaine Lettuce has crinkled green leaves with red speckles. It will grow to a height of 14" to 16" tall and just as wide. Plant in full sun and well drained soil. Pick the leaves when they are small to full size to use in salads. Lettuce will take light frost so you can plant this a bit earlier than other crops. Freckles Romaine Lettuce will mature in about 55 days. Organically grown. ​Freckles Romaine Lettuce ​ is an Heirloom lettuce. Gourmet Salad Mix Lettuce is a blend of green leaf, red leaf, oak leaf, romaine, and buttercrunch varieties. It willl grow to a height of 12" tall and just as wide. Plant in full sun and well drained soil. Pick the leaves when they are small to full size to add color in salads. Lettuce will take light frost so you can plant this a bit earlier than other crops. Gourmet Salad Mix Lettuce will mature in about 45 to 60 days. Organically grown. Lolla Rossa Lettuce is an heirloom variety that has very curly leaves. The leaves are green at the base with bright red ruffled tips. It will grow to a height of 10" tall and just as wide. Plant in full sun and well drained soil. Pick the leaves when they are small to full size to use in salads. Lettuce will take light frost so you can plant this a bit earlier than other crops. Red Lolla Rossa Lettuce will mature in about 55 days. Organically grown.